Trent Nelson | The Salt Lake Tribune Utah Jazz center Rudy Gobert (27) leaves the game with his fourth foul, meeting Utah Jazz head coach Quin Snyder on the sideline, as the Utah Jazz face the Los Angeles Clippers in Game 7 at STAPLES Center in Los Angeles, California, Sunday April 30, 2017. 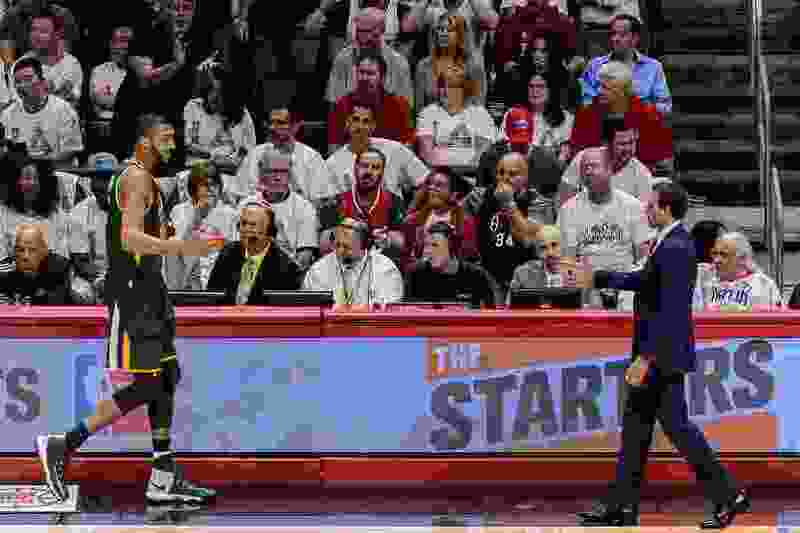 Every offseason, the NBA conducts a survey of the league’s general managers, looking to gauge their opinions on everything from the championship and season MVP favorites down to minutiae such as best international player not currently in the league. With this year’s report released Wednesday, Jazz coach Quin Snyder was clearly fixated upon the results. “I haven’t reviewed that stuff,” he said with a sideways grin. For those who have, there’s plenty to like about how the Jazz are perceived by the league’s decision-makers, such as the team being voted fourth-best in the Western Conference, behind only the Golden State Warriors, Houston Rockets and Oklahoma City Thunder. Of course, there were also a few things to further inflame Jazz fans’ long-held contention that the team is constantly disrespected — namely, Rudy Gobert, who aspires to be one of the best players in the league, garnering a grand total of zero votes in the “best center” category. Speaking generally about the premise of the poll, Snyder said that while seeing how GMs might assess his team can be potentially intriguing, he’s also not going to losing any sleep over it. For what it’s worth, the league’s GMs seem to have a positive view of Snyder himself. Asked who the league’s best coach is, the front-office execs picked Boston’s Brad Stevens first and San Antonio’s Gregg Popvich second, while Snyder was mentioned as “also receiving votes.” However, he fared better in other categories — topping the list in the “Which head coach has the best defensive schemes?” category, tied for third among coaches who “make the best in-game adjustments,” and finishing fourth-best among coaches who run the best offense. Strong defense was a theme for Utah. Asked “Which is the best defensive team in the NBA?” the Jazz were the pick of 45 percent of responding GMs. Boston finished second at 34 percent. Meanwhile, Gobert — the reigning NBA Defensive Player of the Year — was tied with Toronto’s Kawhi Leonard as the league’s best overall defender (they each got 37 percent, while the Warriors' Draymond Green finished third with 17 percent), and the Jazz center was the runaway winner of the “best interior defender” vote, garnering 80 percent. Given that, it was perhaps a surprise that Gobert did not, then, fare well in the “best center in the NBA” conversation. Actually, he didn’t even get a mention. The Pelicans' Anthony Davis was the top pick (he was also named the No. 1 power forward), while up-and-comers Joel Embiid and Karl-Anthony Towns were second and third, respectively. After them, though, came the likes of DeMarcus Cousins, Andre Drummond, Marc Gasol, Nikola Jokic, Al Horford and … Giannis Antetokounmpo? Gobert similarly did not garner a vote in the “best international player” category, won by Antetokounmpo. The Jazz made two minor roster moves Wednesday. First, they waived former Louisville player Trey Lewis, who had been battling a sprained ankle throughout training camp. Then they signed ex-Oklahoma star Isaiah Cousins, who averaged 13.1 points, 4.4 assists, 3.6 rebounds and 1.3 steals in 36 games with the Salt Lake City Stars last season. Other Jazz personnel made appearances in the poll. Second-year guard Donovan Mitchell was touted as the fourth-most athletic player in the league (behind Russell Westbrook, Antetokounmpo and LeBron James), and also received some votes as the player most likely to have a breakout season in 2018-19. Alex Jensen was among those touted as “best assistant coach.” And point guard Ricky Rubio earned some votes as “best passer” in the league. As for the franchise itself, the Jazz received votes as having “the most promising young core,” and as “most fun to watch,” while the team’s fan base earned props for their loyalty and ferocity, as the question “Which team has the best home-court advantage?” saw Utah finish second only to Golden State. While the Jazz didn’t get a vote as an NBA Finals championship contender (only the Warriors, Celtics and Rockets did), they are viewed as one of the West’s best. They got 3 percent of the West’s second-place votes, 33 percent of the third-place votes, 34 percent for fourth place, and 11 percent for the fifth spot. Snyder praised his own general manager, Dennis Lindsey, assembling the roster that warranted those expectations. WHAT DO THE GMS SAY?